With less than a week left for the #SubOnWax Kickstarter Campaign, I've decided to make this once "SUBporter Exclusive" song available to everyone for supporting the campaign. This is one of several unreleased tracks from 2008's Sacrifice and because I am a man of my word, I will still gift everyone who backs the campaign another previously unreleased track from Sacrifice. I finished this song back in the Spring of 2006 and it was originally suppose to be the last track on my sophomore album, Sacrifice. Unfortunately, I lost contact with the producers (The Deffenders) when it was time to finalize and release the album a year or so later and it's remained in the vault ever since. Back in 2011, I got the song remixed by M-Phazes, but when he sent the beat, I loved it, but felt like it didn't work as well as the original track. So instead, I used the remix beat for Grateful on my third album Home Is Where The Art Is, which is why the song themes are similar. 11 years later, this is hands down one of my favorite songs I've ever recorded. Now it's yours! By the way, it should be available on Spotify, iTunes, Amazon, Tidal and everywhere else by the weekend but you can download it right now exclusively on Bandcamp. 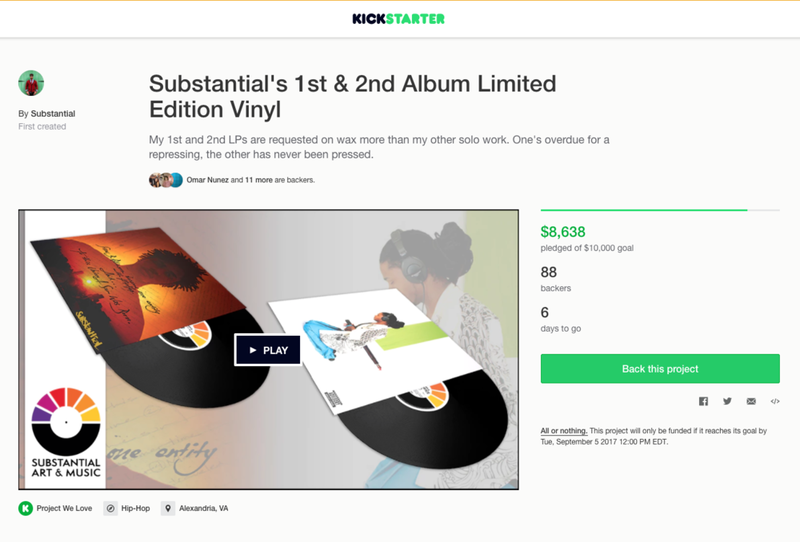 KICKSTARTER UPDATE: As of 12AM (EST) last night, we are 86% backed with 6 days left! We're almost there! Click the image above to pledge today. Lastly, I recently had the pleasure of sitting down with Crowdfunding Cast to talk about my new Kickstarter Campaign. Listen by clicking below.